Social media is a critical channel for businesses looking to distribute branded content to their market. It puts companies in front of marketing qualified prospects who may not yet have thought to conduct a basic Google keyword search leading them to your website. Social media is a powerful channel you can leverage in order to connect with and build your target audience. Reach is the first hurdle in marketing. It represents the starting line of a prospect’s journey down a path that ultimately leads to an exchange with your company. Reach is the combination of followers and their level of engagement, and it is tied inextricably to the content published through your social channels. 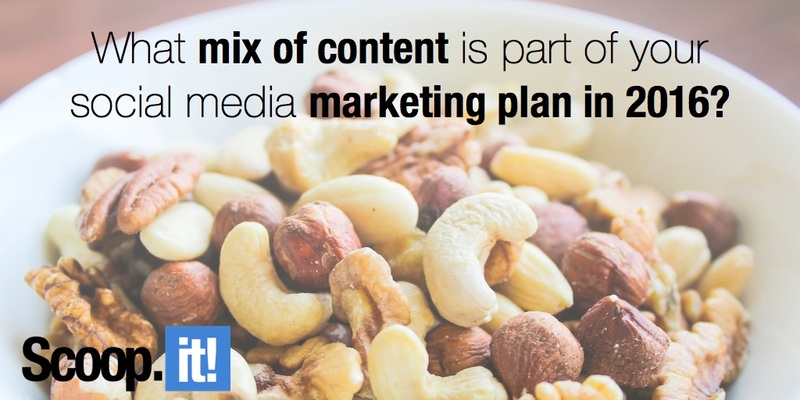 What types of content are you integrating into your social media marketing plan this year? While they may be well-written and aesthetically pleasing, if you don’t optimize them according to your marketing goals, they run the risk of being reduced to a costly cluster of ineffective posts. I am excited to join Scoop.it and Boulder SEO on Wednesday, March 9th at 11:00 am PST (2:00 pm EST) for a complimentary webinar where we will be presenting tips for being more successful with content marketing, search engine optimization and social media for inbound marketing. Registration is open now on a first come, first serve basis. Digital marketing experts Chris Raulf and Julie Gauthier join me in presenting how to create and promote buyer-person targeted content that will boost organic search traffic and generate more leads. This post will cover some of the presentation’s highlights, so you can be confident it’s worth carving out 45 minutes from your busy schedule to make it a priority. Social media is more than a distribution platform for content. When you are a results-driven marketer, it can be easy to forget this. Social media allows us to better hear what others in the market are saying, and it provides further validation for our business through social proof. It also affords us the ability to initiate digital relationships and nurture them into highly valuable personal ones. Setting goals and assigning time to social media marketing produces a powerful soft-ROI that is proven to grow over time. B2B companies with a good strategy and training in place can see direct ROI from prospecting on LinkedIn. For most marketers, however, the days of instant ROI are waning fast. Practices that support long-term goals can help companies to dominate their markets years from now. People are motivated to follow and endorse companies across social media channels like Twitter, Facebook, YouTube and Instagram because they perceive value in the business and want to capture some of it. This behavior is shared by potential and current customers alike. While followership on Facebook doesn’t hold much weight for organic reach, it is a strong testament to the power of social proof. It should also be noted that Facebook’s advertising model is powerful when properly leveraged. Organic status updates on social networks like Twitter and LinkedIn are seen by the followers of B2B companies, whose reactive social activity is in turn seen by their own connections and followers whenever they like or share a status update. A strategic plan of action is necessary in order to steadily grow your followership, and the associated activities vary across each social platform. Your goal should be to see a steady increase quarter over quarter, and year over year across your chosen social networks. Speed of action breeds momentum. A good place to start when examining your followership is your customer base or end-users. Are you connected with them on LinkedIn? Do you have a custom audience for advertising built within Facebook? Have you added them to a Twitter list? You can’t invite people to a party and not deliver on the promise of a good time. People are less inclined to attend if they sense it will be a dud. If it ends up being anticlimactic and not what they expected, there’s a good chance they will lose interest and disengage. They may even leave the party entirely if it’s not what they thought they signed up for in the first place. Engagement is a key indicator of influence. The way we typically want our followers to engage is through our own branded content. At least that’s what all us fancy marketers push. At the same time, constantly tooting one’s own horn is widely regarded as business-centric and not putting the customer first. Who wants to attend a party with a self-centered host? While it may take some time to find the right balance of type and frequency, a regular review of analytics will steer you the right direction. Do not underestimate the power of 3rd party content in your social media. Just because your company didn’t produce it, doesn’t mean you can’t wield it to extend awareness for your brand. Businesses of all sizes are faced with the challenge of efficiently distributing their content. The key factors to engaging a prospect are timeliness and relevance. Effectively influencing them requires delivery of top quality content. When you curate content or share 3rd party content, you can focus on solving the first problem without the hefty cost of producing the content. Curated content turns your social profiles into a hub of information for your vertical. Who says your content has to stay strictly within the swim lanes of your products or services? Your prospects and customers have a lot of other things happening in their lives outside of your industry. I’m not suggesting your content dive into entirely unrelated pools, but consider the greatest problems and opportunities of your customers that are in some way tied to your company’s offering or solution. What can you share on Twitter that might help your ideal customer in that moment and endear you to them? For inbound marketing, it may seem counter-intuitive to direct someone away from your website. However, we know from widely-accepted human psychological theories that being overbearing or clingy doesn’t always incite greater love or connection. In fact, many times this can elicit the opposite effect. Distance makes the heart grow fonder. Sniply: A SaaS, which gives you the ability to add your company’s call-to-action (CTA) to most any webpage you want to share. Simply run the page’s URL through Sniply, and you get a “snipped” URL to share in social media, email, etc. Anyone who clicks on that link will read the 3rd party content in addition to seeing your company’s CTA. Influencers: This is a term attributed to major social media profiles and people. They are those with hundreds of thousands of social media followers. When you share their content, they may take note and in turn, share yours. This kind of reciprocated sharing enhances your company reach in a single moment and far exceeds the value of any paid-to-promote post. The same can be said for sharing the content of those you follow. Reciprocation is a natural form of gratitude. Tracked URLs: We all have our go-to pieces of content that others may have written but that we enjoy sharing with others. I’ve cited a couple in this very post. For sales people, it is an excellent tool for building rapport with prospects. But it’s important to understand the influence of sharing over time. A tracked URL provides you with reliable data on how much your customers value that information. Using SaaS like Bit.ly you can monitor trends and test engagement strategies for additional insight on content you may want to produce more of in the future. Time is the biggest caveat in social media marketing. Curation tools like Scoop.it help you quickly find what you want, reduce tedious activities, and measure performance. If you want to generate more ROI on social media marketing, I highly recommend putting in the time to execute the work manually. Use a tool that is equipped to help you reach your desired goal. Looking forward to having you at the webinar! Image by Cary Bass Deschenes. Marguerite Inscoe had a 12 year career in workplace learning and performance before transitioning to inbound marketing 5 years ago. She has a Bachelors degree in Business Administration and a Masters Degree in Technical and Occupational Studies from Old Dominion University. She is a blogger, social media marketer, email marketer, and certified with Hubspot as a partner. To complement her many hats, she is also a mom, a wife, a choir member, and a martial arts practitioner. Marguerite’s full service agency, ReLaunchU, specializes in internet marketing for B2B companies - particularly those in the consulting and training industries. RelaunchU partners with clients to do the heavy lifting in content production, social media management, website traffic and conversion, and lead nurturing. Their philosophy is to produce marketing the prospects of their clients love and value.